This artist's concept shows NASA's two Voyager spacecraft exploring a turbulent region of space known as the heliosheath, the outer shell of the bubble of charged particles around our sun. Fifty-five years after humans first escaped the bounds of Earth and launched a satellite into orbit, we are about to cross another frontier. We will soon extend our reach for the first time into true outer space – the vast emptiness beyond the protection of the sun. Our emissary is a small, aging spaceship carrying a friendly message from President Jimmy Carter along with recordings of a baby crying and a whale singing, just in case anyone is out there to receive them. Voyager 1 was launched in 1977. After exploring the outer planets, it was pointed toward deep space and a new mission. Today scientists announced it's going to get there a lot sooner than expected. They're already seeing a change in the neighborhood. "We are clearly in a new region where things are changing more quickly," says Ed Stone, Voyager project scientist at the California Institute of Technology. "It is very exciting. We are approaching the solar system's frontier." That frontier is the farthest reach of the solar winds, the particles that shoot from the sun at a million miles an hour, giving us the northern lights as they bend around Earth's magnetic field. That boundary, the very edge of the solar system, is called the "heliopause." No spacecraft has ever reached it, and scientists don't know exactly how far away it is. 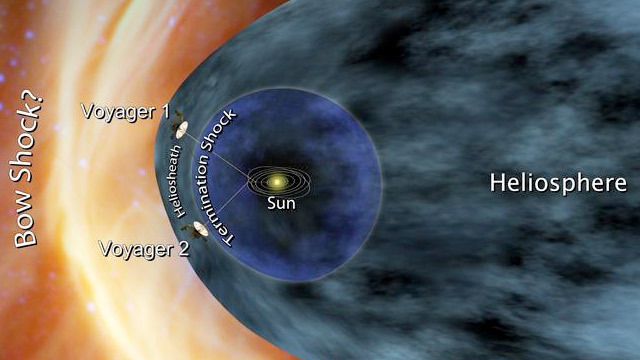 But last month the number of cosmic rays hitting Voyager 1 started to shoot up. Scientists say it's a definite sign they're not in Kansas anymore. Scientists say when Voyager 1 crosses the heliopause mankind will have entered a new era in space exploration. We will have a probe for the first time outside our own solar system and will be able to study particles unaffected by our sun. They say it could give us new clues into the origins of the universe. Voyager 1 has enough fuel and power to send us messages until at least 2020, when it will be 12.4 billion miles from home. But it will keep traveling, even while silent.